In just under two months our sweet Evelyn turns two. At this stage in our other girls lives they were either a new big sister or about to become one. To not cause too much confusion all at once we made early transitions from the crib to a toddler bed for each of them. I felt it was easier to adjust to one change at a time and not have to uproot them from their beds in addition to welcoming their new sibling, and it seemed to work. They all adjusted very well to the change and continued with their usual sleep habits from night one and beyond. Things are a little different this time around with Ev. She is our last baby and there is no need to adjust life for a new sibling. I debated with myself quite a bit on whether or not she would be ready to leave the crib at this age but in the end decided to go for it. I have to admit I am both a little sad and excited for this change. This transition is feeling a lot like the end of an era. 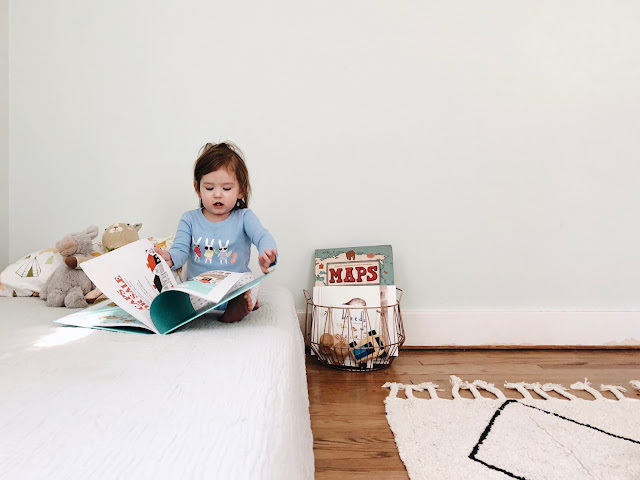 While it is sad to say goodbye for good to the baby years, I am having a lot of fun saying hello to the toddler years and the new room I get to create for her. Some plans throughout this bedroom make-over progress have stalled while we finalize decisions and other plans have changed entirely. For starters, we have decide to leave the mattress at ground level for the time being. It makes the bed a little safer and easier for her to climb in an out of. I also think this will help in the planned summer time potty training if she is able to quickly get from her bed to the bathroom. Having to climb out of a taller bed would definitely stall the process. The second change we made in our plans was painting the room. We had first decided on Sherwin Williams Passive but then thought to keep the color as is, a light robins egg blue meet sage green depending on the lighting. It is very subtle but just enough color to really make the room stand out from our rather monochrome first floor. Well, after leaving it as is for a few weeks I have changed my mind once again and am back to my Sherwin Williams paint deck to choose some possible colors. While it doesn't look like a lot to most, progress is slowly being made and I am happy with how it is all coming together. My favorite addition to her room by far is her Lorena Canals washable rug. The modern and simplistic Bereber Beige rug was the perfect addition to the space and I can't tell you how amazing of a feeling it is to know that any mess and spill can be taken care of by simply throwing the entire rug into the washing machine and dryer for easy clean-up. It's amazing! Not to mention, all Lorena Canals rugs are eco-friendly and handmade from 100% natural cotton that is naturally dyed and contains no VOCs unlike most carpets and rugs. It is an all around great rug and on top of it all it is beyond soft. We have enjoyed hours of playtime on it so far! Stay tuned for more updates as the room is finalized.